The present confrontation between the Italian government and the European Commission over the size of Italy’s budget is another episode in a long-running drama about whether Italy’s membership of the euro is compatible with any viable monetary, fiscal, and political structure for the euro that any German government could bear. Italy was not supposed to be in the euro, and, consequently, monetary union was not set up with rules or an institutional design to accommodate it. The Maastricht treaty established no fiscal rules for when the euro began and such restrictions were only agreed in a rather weak form via the Stability and Growth Pact when in 1997 it became clear that Italy would in fact be a member of monetary union. The treaty also did not create a lender of last resort or allow bail out provisions, which meant Italy, and other southern European states, would have to manage their debt on their own inside the euro, or one day the whole conception of the European Central Bank (ECB) as a central bank would have to be reformed to accommodate their inability to do so. The Italian problem was disguised during the pre-crisis years by inattention to risk in the financial markets, even as Italy’s inability to devalue left its economy with weak and at times nonexistent growth. But the start of Greece’s woes in late 2009 opened the path to exposing the Italian problem by concentrating investors’ minds on the fact that nobody could guarantee payment on the vast volume of outstanding Italian bonds. When in 2011 this reality pushed Italy to the precipice of being shut out of capital markets, the ECB extracted a high political price for offering Italy support for its debt. In early August 2011 the outgoing and incoming Presidents of the ECB wrote to the Italian Premier, Silvio Berlusconi, and made a set of demands for legislation as a condition of the ECB reactivating purchases of Italian bonds under its Securities Markets Program. When Berlusconi could not deliver on his initial promises to meet those demands, the ECB substantially cut its purchases of Italian bonds. Angela Merkel then appears to have used the consequent pressure on Italian bond yields to persuade the Italian President, Georgio Napolitano, to remove Berlusconi from office. With Berlusconi gone, Napolitano appointed a technocratic Cabinet. Put differently, at this moment Italian membership of the euro was made compatible with the terms of monetary union upon which Germany insisted by substantially diluting democratic politics in Italy. Italy’s democratic politics, however, has returned with force. The coalition between Lega and the Five Star Movement may lack an elected Prime Minister or Finance Minister, but the de facto leader of the Italian government, Matteo Salvini, believes there are votes to be won in challenging the authority of the European Commission to constrain Italy’s budget deficit. In this respect, Salvini is far from alone, with his rhetoric bearing clear similarities to that deployed in the autumn of 2016 by Matteo Renzi in the last confrontation between an Italian government and the Commission about the proposed size of the Italian budget deficit. 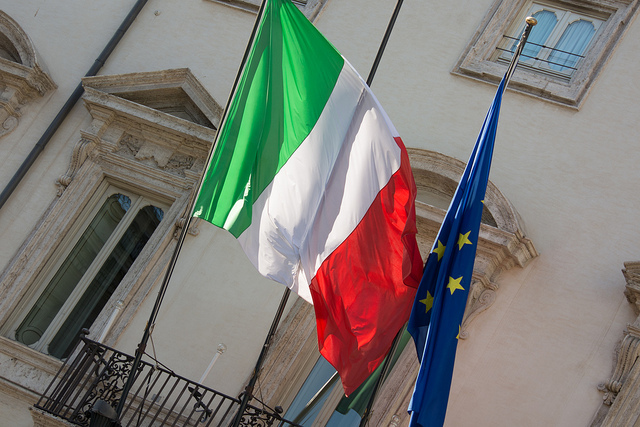 Moreover, it is far from clear that enough Eurozone governments would back the Commission over punitive action against Italy, which would entail levying a fine of up to 2 per cent of GDP, around €4 billion. Some of these governments understand very well that the rhetorical assertion by the Commission that the time for rule-breaking over lenience must come to the end will leave them vulnerable when the next recession arrives, especially if the government concerned is not one whom the Commission sees a need to appease. For the Commission to win, investors, the bond markets or the credit rating agencies must help. The Italian government cannot afford for ten-year yields to rise much above 5 per cent, or for these bonds to lose an investment grade rating. Italy simply has too much debt to recycle and must remain eligible for ECB purchases and reinvestment via the credit status of its bonds. But the difficulty for the Commission is that the credit rating agencies and bond markets may not oblige. Indeed, the yields on ten-year Italian bonds have actually been marginally lower since the Commission gave its first verdict on the Italian budget deficit on 23 October than they were in the run-up to the Commission’s decision. Seven years ago, under the financial conditions that led to Berlusconi’s exit, the bond markets would certainly have already pushed Italian bonds to the precipice. But the belief in the markets generated by the announcement of the Outright Monetary Transactions (OMT) in September 2012 that the ECB would indeed act as a lender of last resort if necessary and then crucially the ECB’s Quantitative Easing (QE) programme from 2015 have pushed yields much lower than they were. The irony is that the ECB began QE precisely to stop contagion from Greece to Italy with the arrival in power in Athens of Syriza, and now finds that as a consequence of QE bonds markets do not so readily constrain recalcitrant states. Nonetheless, whether the bond markets oblige the Commission or not, the Italy problem will not go away. Italy cannot do without the ECB acting as a lender of last resort and QE is due to end in December. Now the ECB has practiced QE for three years no Italian government will wish to accept that future support for Italian bonds should come from the thus far unused OMT, when access to the OMT depends on first signing a memorandum of understanding, which would invariably include new fiscal conditionality. But there is also no reason to suppose that German domestic politics could readily withstand the return of QE if Italy’s position in the bond markets substantially deteriorates and the German Constitutional Court still had to render a final verdict on whether QE is constitutional or not. This issue of how far and for how long the ECB can back the debt of member states will ultimately be more important than whether the Commission can successfully enforce the Eurozone’s fiscal rules. The ECB has gradually emerged since 2010 as a lender of last resort, and in so doing addressed one of the predicaments generated by the misalignment of the monetary and fiscal rules established in the Maastricht treaty and Italy’s membership of the euro. But its capacity to act in this way has not been legitimated and remains subject to contest in Germany. Without that contest being decisively settled in favour of the ECB, Italy’s debt is likely to be unsustainable. Yet if Germany has to accept regular episodes of QE to support Italy, German consent to monetary union is likely to break down. The fundamental structural problems generated by the creation of a monetary union with a membership and terms that nobody intended have proved inescapable. Italy’s very participation in monetary union was a defeat for Germany and rendered void the terms on which the German government had acquiesced to it at Maastricht. Yet the terms of German ratification of the Maastricht treaty nearly two years later in the decision of the German Constitutional Court also ensured that when the crisis that was always ultimately going to be generated by this disjuncture of rules and membership finally arrived Germany would have a de facto veto power over how the predicament would be addressed. The battlefield of this conflict has become the European Central Bank’s now massive balance sheet. The German preference in any potential compromise would almost certainly be for the ECB to move to OMT since that would give direct leverage over Italy’s budget. But an informal version of this state of affairs in which the ECB had the discretion to buy or not to buy Italian bonds in the face of changing domestic politics in Rome is what precipitated the era of technocratic Italian government under Mario Monti, which did as much anything else to create the conditions for the rise of the present ruling Italian coalition. Whatever the European Union’s ability to muddle through crises, something in the case of Italy and the euro will eventually have to give. The workings of the Eurozone cannot themselves be made more responsive to shifts in democratic politics because the Eurozone was constructed at German insistence around rules between states that if they are to work need to be enforced regardless of national election outcomes, even as there is political disagreement between states and across national political spectrums about what those rules should be. But national democratic politics also cannot be removed from the Eurozone because national elections create expectations that national elected representatives should prevail over European officials, even as the most significant question for Italy’s economic future is whether the ECB can continue to support Italy’s debt after QE ends. One way or another the fate of Italy will determine what kind of monetary union, and with which member-states, can survive.